To explain why so many millions of people have significant pollen allergen and other environmental allergies or hypersensitivities, we must go beyond the currently used medical paradigm in which humans are viewed as an elaborate concoction of chemical processes, and who need pharmaceutical intervention when things go awry. Basically, all allergies are caused by a clash of incompatible frequencies. At our core, below the atomic level, our physical bodies are made up of an intricate symphony of specific vibratory frequencies. This is now well known and accepted in modern quantum physics. Yet this proven concept has not been integrated in to the current medical/pharmaceutical model of practice. Conventional medical science does not know what organizes and directs, or how to repair, that amazing biochemical symphony. To try to repair it with a synthetic drug is like asking a gorilla to edit a symphony! The human body energy field is run by the laws of quantum physics and is the conductor of this complex, multilayered symphonic masterpiece. The cure or correction must start there. It’s often not in the best long term interest of patients to focus exclusively on the final effect of chemistry gone wrong. So, how does all this relate to pollen allergens and most other allergens? Well, when a pollen allergen of certain specific frequency penetrates the body’s defenses and is identified as an invader by the immune system, a vibratory storm ensures. And, depending on which one of the energy meridians (and their sub-channels) is disturbed by this invisible assault, the symptoms will emerge that are unique to that particular meridian; for example, if the lung meridian is disturbed then you would have symptoms that relate to respiratory distress, skin allergies, and more. But what if you have 4 or 5 meridians out of balance at the same time due to a pollen allergy reaction? alterations in heart and/or pulse rate. aches & pains anywhere in the body etc. Yet, you would probably just be focused on your coughing, sneezing, tearing and sinus issues like post nasal drip. 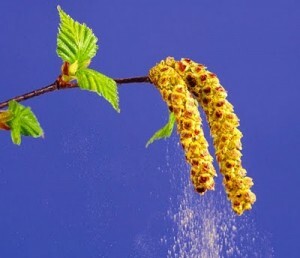 How do you eliminate the symptom picture of pollen allergy at the deepest level? Therefore, it is important to correct all of the involved meridians triggered by pollen allergens and other environmental allergens; and, at the same time, make all of the adverse environmental frequencies harmonious with and accepted by your bodies energy field and immune system. This will eliminate the obvious symptom picture at the deepest and most comprehensive level; and this is best accomplished with a proven, bioenergetic allergy technique. Dr. A. I. Cushing D.C.,D.Ch.,C.N.C.F.S.A.C.